Life is short. Use the china plates. We had an interesting weekend, with my parents coming to town to support Shannon’s senior year participation in the pit orchestra for “Phantom of the Opera” at JJ Pearce HS. On Saturday, in the rain, Jack participated in ‘Scouting for Food’ with his new BSA Troop 444. Later, it was basketball with the Colts and Coach Z. The story is for another post, but the Colts lost in a close game….after leading for the first 3 1/2 quarters. That attitude doesn’t just apply to sports. It applies to LIFE. I’ve been leading a class at church titled “Chasing Daylight,” by Erwin McManus. The title encourages us to use all we have – every minute of daylight, if you will – to bring joy into this world. Last night, I brought that concept to the dinner table. 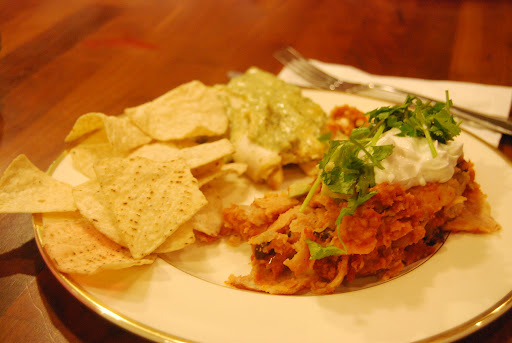 We served our meal of chicken enchiritos with tomatillo and cilantro cream sauce, coupled with sweet potato and black bean enchiladas (for the vegetarian in us). Times like this don’t come around every day. And there were still a few hours in the day that we could find some hidden joy somewhere. As we get older, and get on with our lives, dinner with our parents is a blessing in itself. A specially cooked meal made it more so. But there was still a bit of Daylight left – so I pulled out the china plates, and served dinner. Life is short. God is waiting for us to share love and joy. Don’t let the china (or our spiritual gifts) sit in the cupboard.